The Lightning Dreamer: Cuba's Greatest Abolitionist by Margarita Engle. Review: Picture yourself at the age of 13. In your country, you are banned from being able to think. You don't go to school; you aren't allowed to. You can't write; you aren't allowed to. You can't read books; you aren't allowed to. But you defy that rule. Running out to the garden at nighttime when everybody's asleep just so you can read what happens to the witch and the troll. This is the life of Tula, a Cuban abolitionist who doesn't believe that every rule should be followedÉ. 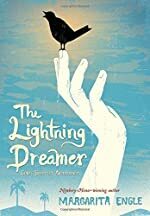 In The Lightning Dreamer, by Margarita Engle, Tula does NOT want to live a normal life, the way every other girl lives in Cuba. Because, every other girl in Cuba is either a slave or not allowed to do anything but sit and clean the house. Tula goes out into the night to read books while her parents are asleep. Her job of keeping up with the tutor, secretly reading books, and trying to free the little slaves is quite a handful for a thirteen-year-old girl, especially when your mother is watching you like a hawk. The Lightning Dreamer is very good. I enjoyed reading it a lot. I think this book gives a lot of inspiration to girls around Tula's age in saying that they could do anything if they tried. It doesn't matter about their age. This book was written through poetry, so it was a very interesting and a refreshing way to read a good book. The Lightning Dreamer also shows different perspectives of the characters. For example, it showed what Tula is thinking, and then on the next page what her brother thinks of the situation. I would recommend this book to anybody, for it is a great read for all ages. We would like to thank Houghton Mifflin for providing a copy of The Lightning Dreamer: Cuba's Greatest Abolitionist for this review. Have you read The Lightning Dreamer: Cuba's Greatest Abolitionist? How would you rate it?